We proudly specialize in authentic wooden men's watches you can count on. never use composite materials or low grade wood replicas to make our wood watch. men work together to automatically deliver a display of hours, minutes & seconds. the wanderer or traveler in men both young & old. Husbands, brothers, dads & bosses love it! wooden watch, contact us for a free replacement or full refund within 30 days of delivery. Time will only tell how much this wood watch will simplify & enhance your days. Make the smart move. Order your Wilds wooden watches men now! 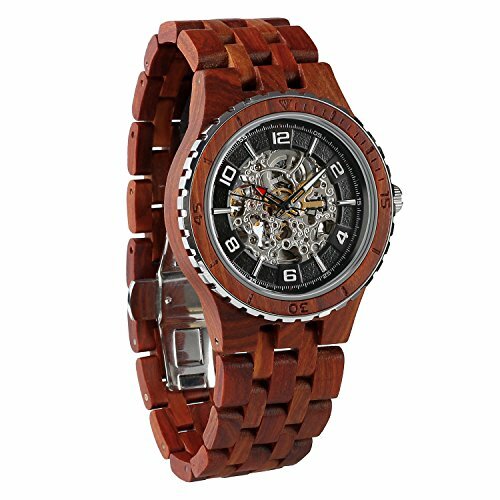 ALL NATURAL WOOD: Our ultra premium wooden men's watch is made out of 100% natural wood (with the exception of the dial, the gears & the folding clasp). We know how to do wooden watches right here at Wilds wood watches! CRAFTED BY HAND: Every single wooden watch we produce has been carefully handcrafted to perfection in order to ensure the highest quality. Our wood watches for men are the trendy investment pieces you've long been waiting for. STRONG & DURABLE: A solid wood casing & an extra tough scratch-proof glass overlay give these designer men's wooden watches the unique ability to ruggedly withstand day-to-day wear & tear. COOL GEAR FACE: Featuring a transparent body that showcases the mechanical gears inside as they work & fitted with an adjustable all wood wristband, our wooden watches for men combine practicality with modern style. GREAT GIFT IDEA: Since guys of all ages love them, these men's wooden watches by Wilds make excellent gift ideas for birthdays, the holidays, Father's Day, anniversaries, retirements, promotion parties & so much more! It also includes easy band adjustment tool, so no more worry about not knowing your love one's wrist size. If you have any questions about this product by Wilds, contact us by completing and submitting the form below. If you are looking for a specif part number, please include it with your message.